What happened to the glamour of air travel? 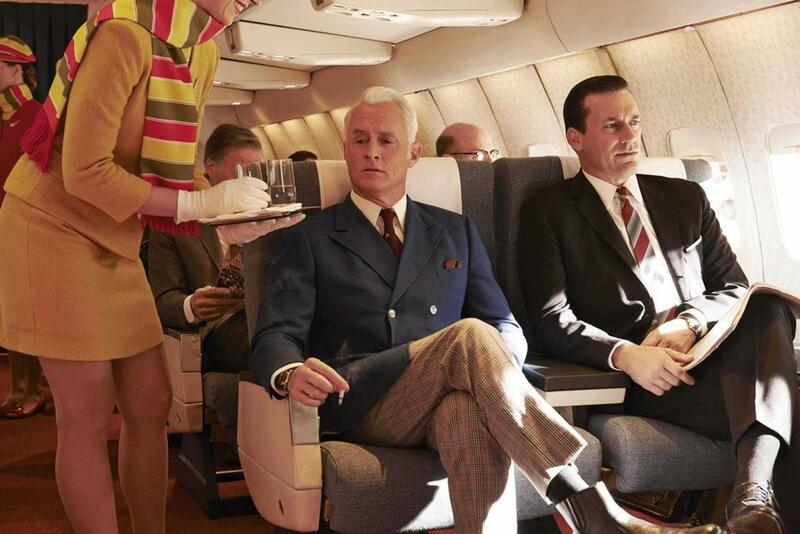 During the golden age of commercial air travel, in the 1960s and 1970s, flying was akin to being at a cocktail party on wings when everyone dressed for the occasion. The juxtaposition was almost too perfect, although perfect is probably not the best adjective to describe it. On a flight to Chicago earlier this summer I was seated next to a college-age woman who hiked up her sweat pants to her calves. She kicked off her filthy flip-flops and pulled a bag of peanut M&M’s out of her backpack, diving in with the decorum of a rabid raccoon. As she did this, I watched a Smithsonian Channel documentary on my laptop called “I Was a Jet Set Stewardess.” I saw vintage clips of beaming, bouffanted air hostesses (such a welcoming term!) pushing around well-stocked bar carts while dishing out seven-course meals on fine china. On this flight my meal was one course, and it consisted of a can of Diet Pepsi. I was immediately nostalgic for an era I never experienced. 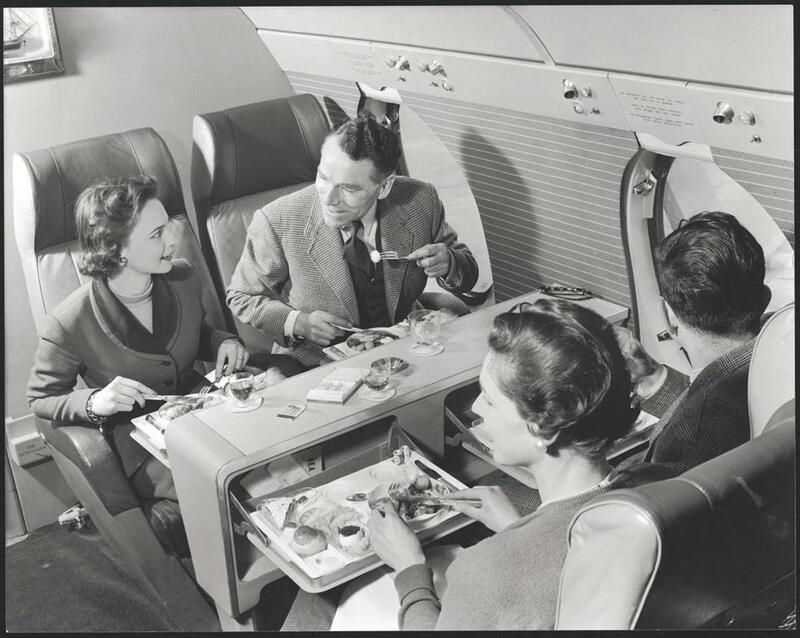 “It really was as glamorous as it looks,” said Thor Johnson, a former Pan Am vice president who worked for the airline during the golden age of commercial aviation, considered to be the 1950s and 1960s. “We served those beautiful meals, and people dressed up when they got on the plane. There were dress codes, but people would have dressed well even without rules,” he said in an interview. Unless you’re able to splurge for first class — or you own a private jet — travel is now anything but glamorous. Airports are crowded with women sporting bed head and donut pillows permanently affixed to their necks. Men in shorts and tank tops lifelessly pull carry-ons behind them, belabored expressions on their faces. They drag limbs across linoleum as if they’re extras from “The Walking Dead,” although these airport zombies always seem to have screaming children in tow. Jeff Jacoby: Do you have the right to recline? The airplane is no longer a cocktail party with wings. It’s a hulking, hermetically sealed tube crammed tightly with seats that gather us in one location and deposit us in another. This is reflected in the way people dress. She likens air travel today to boarding a bus with wings, although I’m quite sure I’ve seen people dress better on buses. Returning home from California last month, my plane was filled with brawny types who had participated in a national CrossFit competition. Many were still wearing the same clothes they had on while competing, and others sported those terrifying Vibram toe shoes. How I longed for one of those well-coiffed air hostesses of yore to swing by and offer me a stiff cocktail. 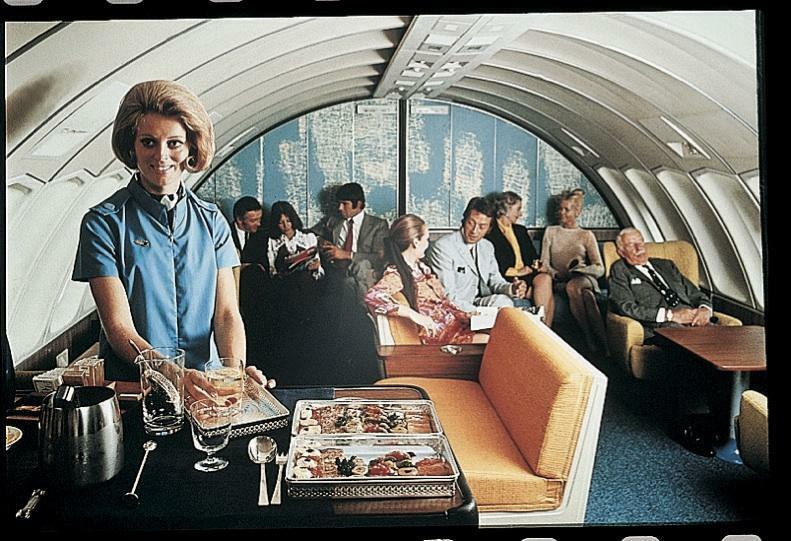 If you’d like to cast blame for the depressed state of airline fashion, look no farther than the 1970s. The decade ravaged good taste, and that included the way people dressed on airplanes. It started in 1978, when President Jimmy Carter signed the Airline Deregulation Act into law. When deregulation occurred, airfare pricing wars commenced. As competition grew and prices dropped, something had to give, and that something was free booze and fancy meals. 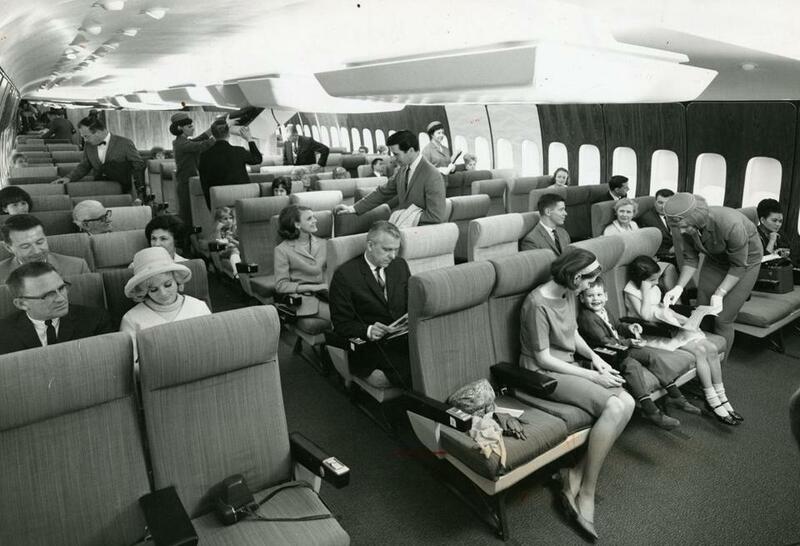 Lower prices helped democratize air travel, but it effectively squashed the halcyon glow of the golden age. Flights no longer resembled a cocktail party hosted by “Mad Men” character Betty Draper Francis. The era is romanticized everywhere. My favorite scene in the Leonardo DiCaprio film “Catch Me If You Can” is when DiCaprio’s character parades through the Miami airport with a cadre of stewardesses as Frank Sinatra croons “Come Fly With Me.” To advertise season seven of “Mad Men,” AMC put the show’s characters in various states of flight. ABC created (and quickly canceled) a TV show set around the exploits of Pan Am stewardesses in the 1960s. Reproductions of Pan Am flight bags are still sold. I’m no Prudish Pete, but I get cranky when I see blatantly slovenly adults on airplanes. I don’t put on a suit when I travel, but I usually wear a light sweater over a shirt with jeans and a decent pair of shoes. Compared to some of my fellow fliers, I look like a modern-day Yves Saint Laurent. There are plenty of alternatives: stylish, comfortable wrinkle-free shirts and a growing number of dress pants and blazers constructed of sweatshirt material. These clothes allow you to be a secret slob. When I sit next to someone wearing pajama bottoms, I wonder if there’s a dress code to put a stop to the slobification of travel. There have been a few cases of passengers being asked to change their ensembles. An airline was upset with a woman showing too much cleavage, a football player was reprimanded when he refused to pull up his low-hanging pants, and an Arizona businessman caused a sensation when he showed up at the gate in tatty Frederick’s of Hollywood underthings. But for the most part, Harteveldt and others say on any given flight, they encounter plenty of mundane fashion don’ts. New attitudes toward dressing for airplane comfort are a clear reflection of how we all dress more casually today than people did 40 years ago. But both Yavari and Johnson said that dressing decently is a matter of common courtesy toward fellow passengers. And fashion designer Nili Lotan said a seven-hour flight is not an excuse to roll up to the airport looking like a tatterdemalion. But for some travelers, it’s difficult to worry about how you look when you feel that your dignity is being assaulted. Flights have also grown in length, and passengers are so uncomfortable in their tiny seats that they’re now bickering over how far their chairs should recline. When you’re flying nonstop from Boston to Beijing, that donut pillow begins to look like a very appealing fashion accessory. So far I’ve held off on donut pillows, sweats, and shorts. I don’t expect that the woman sitting next to me on a flight will be wearing kitten heels and a pencil skirt, but for the love of Lindbergh, please keep those flip flops away from me.